Explore, Learn, Have Fun! : Back to School Giveaway~Orkin Household Pests 101 Back to School prize pack! 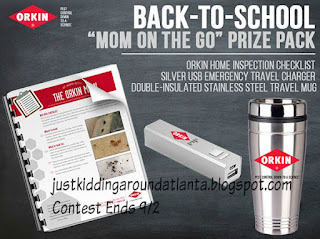 Back to School Giveaway~Orkin Household Pests 101 Back to School prize pack! It’s back-to-school time and class is in session! Orkin is back with Household Pests 101 – featuring some of Orkin’s scientific knowledge of pests. The Orkin Man is here to help you #LearnWithOrkin so you don’t get schooled by pest problems in your own home. • Class is in session! Orkin is back with Household Pests 101 – featuring some of Orkin’s scientific knowledge of pests. The Orkin Man is here to help you #LearnWithOrkin so you don’t get schooled by pest problems in your own home. • Watch the “Bite Back at Mosquitoes” video, as well as the rest of Orkin’s How-To video series, to get the most up-to-date knowledge on dealing with those pesky home invaders. • Download the “Protect Your Home” Checklist for valuable tips on keeping pests at bay. Check out the great Prize Pack Orkin wants to give one of my readers! Each household is only eligible to win Back to School Prize Pack via blog reviews and giveaways. Only one entrant per mailing address per giveaway. If you have won the same prize on another blog, you will not be eligible to win it again. Winner is subject to eligibility verification. Rollins Inc. is providing the prize, as well as the information in this post. I also received the same prize pack, in exchange for posting this giveaway. No other compensation was received. We LOVE Orkin Pest Control!! We have trusted them to treat our home for years and have always been happy with our service! I learned that covering fire ant mounds with grits doesn't work. I had always been told that it would work; interesting. I learned that the house fly is worse than the cockroach as far as contanmination goes. The earwig freaks me out. They seem to love my pool towels. I learned that mice can fit through a hole the size of a dime! I get so annoyed by mosquitos! At least now I know they are attracted to puddles of water! Roaches drive me crazy and are just gross!